FAIRFIELD, CA--(Marketwire - Feb 16, 2012) - William Lyon Homes does their homework to give families the best new home opportunities and that means desirable locations, spacious floorplans, financial value and access to a great education for their children. At The Enclave, situated along the 18-hole Paradise Valley Golf Course, young students attend the K-6 Rolling Hills Elementary School, conveniently located near this beautiful neighborhood. A bright future starts right and learning the three R's never looked so good. "Finding the right home also means choosing a neighborhood that fits a family's individual needs -- and that includes acclaimed schools for their children. An excellent education is often a top priority for parents and we are delighted that we can offer them a lifestyle that covers this very important goal," said Lesley Pennington, Vice President of Sales for William Lyon Homes. "The local elementary school has a wonderful reputation for academics, so it's a definite draw for The Enclave buyers with young children. In fact, a majority of our recent homeowners are growing families, including several who took their kids out of their private school and enrolled them in Rolling Hills Elementary." The last new home opportunity in Paradise Valley, The Enclave has surpassed the 50 percent mark for overall sales and continues to generate impressive demand. Presenting luxury homes that range from approximately 2,059 to 3,056 square feet, a golf course community and prices from the mid $300,000s, The Enclave offers smart consumers more home for their dollar and a prestigious lifestyle. This single-family neighborhood is a unique address and there is a growing sense of urgency to act soon for the best selection in the current phase release, which showcases stunning views of rolling green hills and allows buyers the time they want to personalize a favorite floorplan. The Enclave's one- and two-story designs have up to five bedrooms, three bathrooms and three-car garages. Each home comes complete with modern appliances, state-of-the-art construction, new plumbing and heating systems, while long-term builder warranties give buyers the confidence and peace of mind they deserve. For more immediate information on this fairway-inspired collection, visit www.lyonhomes.com/theenclave. A convenient location near popular leisure and recreation destinations enhances the overall appeal of this neighborhood, placing residents within easy reach of farmers' markets, Westfield Solano Mall and parks. The world-class wineries of Napa/Sonoma are a 30 minute-drive, the perfect distance for a weekend escape. During a visit to the models and sales gallery, guests should inquire about fixed rate FHA financing that requires only 3.5% down, as well as the advantage of VA and Conventional loan options. Visitors can also learn more about favorable tax deductions. FHA, VA and Conventional program guidelines and loan limits are subject to change. All loans subject to credit approval; restrictions may apply. Down payment, payment terms and rates vary based on market conditions and qualifying requirements. A 3% Broker Referral Fee is offered at The Enclave. Brokers must bring their client on their first visit to register. Broker Referral Fee to be paid at the close of escrow. To reach The Enclave from the Bay Area, take 80 East, exit to right on Manuel Campos Drive/N. Texas Street exit, turn left at second Paradise Valley Drive and turn left on Champions Way. Turn left on Stewart Drive, left again into Annandale Court and the sales gallery will be on the right. From the Sacramento Area, take 80 West, exit to left on Manuel Campos Drive/N. Texas Street exit, turn left at second Paradise Valley Drive, and turn left into the community on Champions Way. 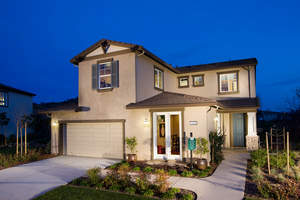 The Enclave sales gallery and models are open daily from 10 a.m. to 5 p.m. For more information, call 707-427-2226. It matters who your builder is, and William Lyon Homes means it when they say that they put themselves into their homes. They build each and every home as if it were their own and have earned a solid track record for constructing homes throughout the West since 1954. Learn more by visiting www.lyonhomes.com to access the latest information on William Lyon Homes' new neighborhoods.